This article was originally published in RC Driver’s July 2015 issue. The R&D department at Pro Boat has been consistently working on its line of boats to give us RC enthusiasts a great selection of diverse boat options for us to choose from. One of Pro Boat’s latest creations builds off of its popular Blackjack line of electric powered catamarans, enter the Blackjack 24. It has a striking appearance, measures two feet long, comes out of the box nearly 100-percent ready for the water and is equipped with a powerful brushless motor and speed control, a reliable 2.4GHz radio system and waterproof electronics. My first impression of the Blackjack 24 was that this smaller boat will not come close to offering the same awesome performance found with the larger Blackjack 29. Is its size deceiving? Let’s find out. • Offset rudder does not allow the boat to turn equally in both directions, how ever it won’t hinder speed in the corners and speed is good. • Pins in the canopy are loosely mounted and this makes inserting and removing the canopy from the hull a bit difficult. Pro Boat did a great job offering a boat that bridges the gap between its tiny electric nine-inch boats and its larger boats that are in the 30-inch realm. 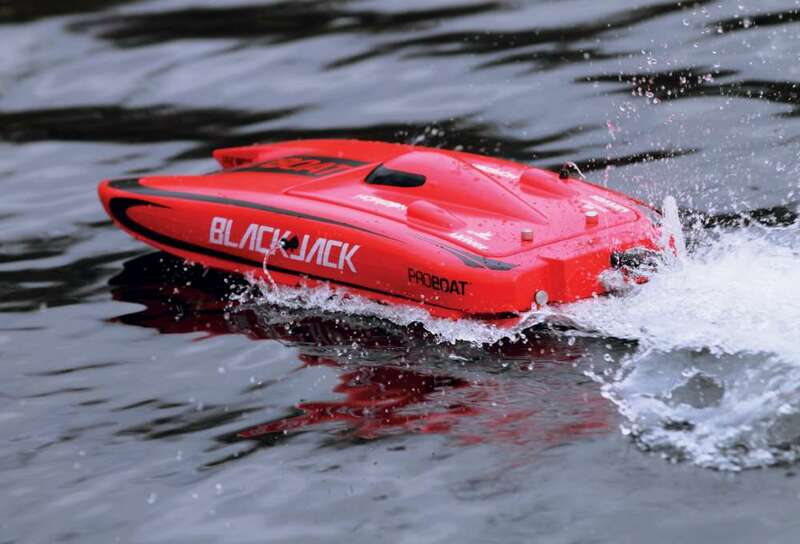 The Blackjack 24 is small enough that it is easy to transport and run in smaller bodies of water yet large enough to be easy to work on and provide killer performance, especially when powered with a 3S LiPo battery pack. Once I removed the Blackjack 24 from its packaging, I was struck by how brilliant the red and black colors of the hull are in person as opposed to the pictures on the box. These colors work extremely well with the Blackjack 24’s distinctive graphics layout and sleek racing hull design, it is one sharp-looking catamaran. Along with the boat itself, Pro Boat includes the ECX 2-channel, 2.4GHz pistol grip transmitter. It is a no-frills looking radio, but it is equipped with all the necessary features you would need. Located near the steering wheel are the throttle and steering trim knobs, perfect for making quick adjustments while running the boat. Under the plastic cover on top of the transmitter is the on/ off switch, battery level indicator, steering and throttle reversing switches and knobs for adjusting steering and throttle dual rate. It is powered with four “AA” batteries and this keeps the radio super lightweight. ABS plastic is utilized to form the catamaran’s hull which helps to make the Blackjack 24 very light. Without the battery installed, the boat weighs only 2 pounds and 14.2 ounces. This means less power is required to make this boat move really fast. The canopy is held in place with two metal pins at the front that slide into holes in the hull and at the rear of the canopy are two metal thumb screws to keep it secure. Each of the metal pins is held in place with an E-clip which holds it loosely. This makes it a bit troublesome to insert and remove the canopy. A foam rubber-type gasket lines the groove where the canopy comes into contact with the hull. This setup is not intended as a watertight seal, but will help keep the water that finds its way into the hull to a minimum. For the water that does make it into the hull, don’t worry, Pro Boat equipped the Blackjack 24 with waterproof electronics and a convenient drain plug installed in the stern. If you have ever tried to get all of the water out of a hull that does not have a drain plug, you know how difficult it is and understand the value of having one. Inside the hull, you will find a one-piece tray where all the electronics are mounted. It should be noted that Pro Boat put out an addendum for the radio tray where they found that some of the trays were not properly adhered to the hull at the factory. The fix is easy. Attach the tray to the hull using some CA (Cyanoacrylate) glue. Go online to view the actual addendum for more specific details. A way to know if your Blackjack 24 is affected is by looking for a large green inspection dot on the tray near the motor. If your boat has the green dot, it was assembled correctly and no action is needed. Mounted on the electronics tray you will find a Spektrum S603 standard servo tasked with steering duties. Just ahead of the servo is the ECX receiver which has the bind button and the on/off switch attached to it. On the on/off switch, there is also a battery chemistry button so that you can switch between LiPo, NiMH and NiCd battery packs. This is an important feature so that you don’t run the voltage down too far when using a LiPo pack and therefore ruin it. 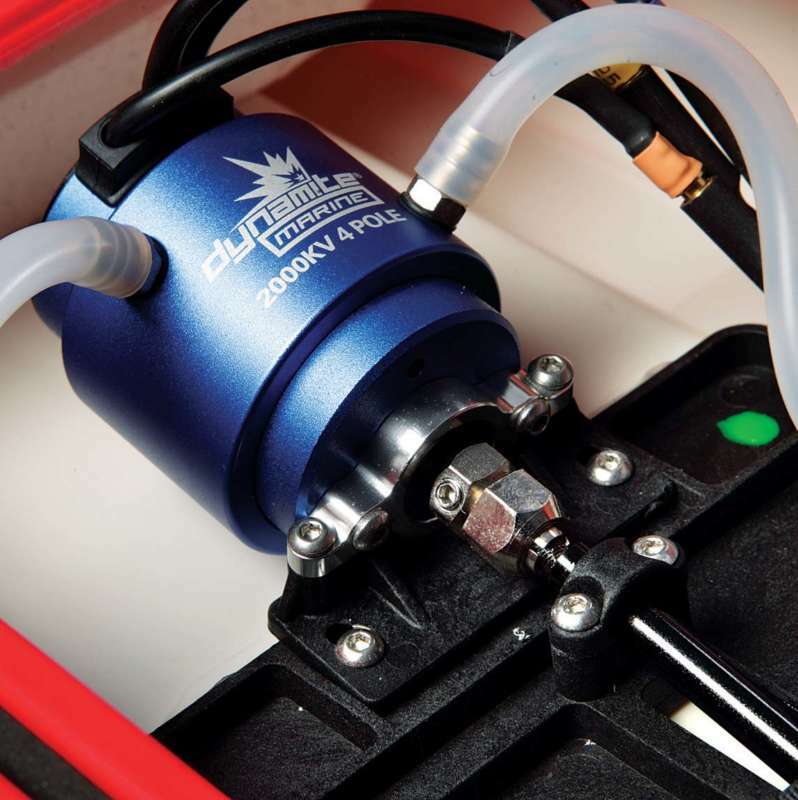 Harnessing the power to the brushless motor is a Dynamite 30amp, water-cooled speed control. 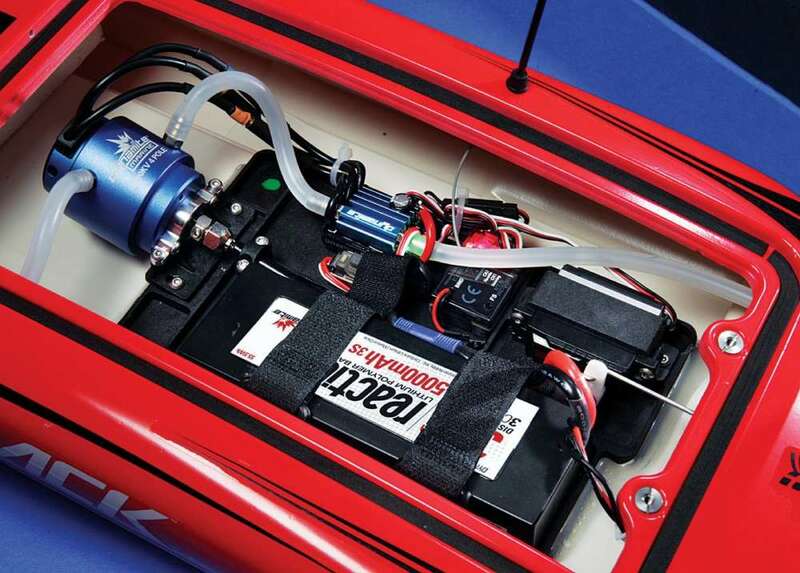 It is capable of running off of a 3S LiPo pack to help make the Blackjack 24 wicked fast. The muscle behind the Blackjack 24 is a powerful Dynamite 2000Kv brushless in runner, 4-pole motor. Like the speed control, it is cooled by the water-cooling system which is vital for a high speed boat with an enclosed hull. A hole in the rudder is the water pick-up for the cooling system where water is routed via rubber tubing through the speed control, then to the water jacket on the motor and it then exits out the port side of the hull. Quality machined aluminum is used for the running gear found on the stern. The rudder is offset to the right of the propeller shaft. This is a common design for boats built for speed. Moving the rudder out from behind the prop allows the boat to maintain speed in turns while still allowing plenty of control of the boat. The position of the propeller shaft is adjustable via the aluminum strut so that you can tune the boat for specific water conditions. Curiously, the prop that came on my boat is 1.62×2.06, but the instructions and the Pro Boat website has it listed as a 1.34×2.06. I assume it was a running change where it was found that the larger prop enhanced the 24’s performance. 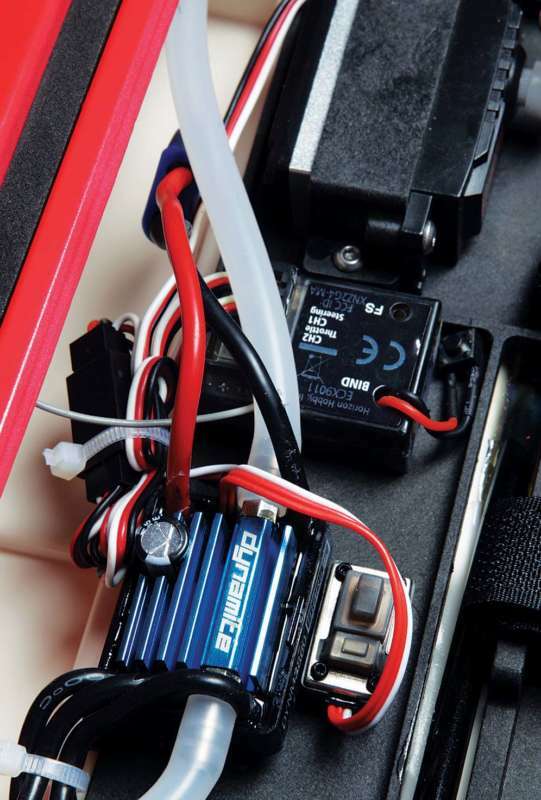 I started off with a 2S LiPo battery pack to test the Pro Boat Blackjack 24. Before hitting the water, I double-checked its operation to make sure everything was functioning properly. Once the battery was plugged in and the transmitter was switched on, I powered up the speed control and after a couple seconds and beeps, the system was calibrated and ready for action. All the controls worked correctly so I tightened the thumb screws on the canopy and placed the boat in the water. Gently pulling the trigger causes the prop to quickly churn up the water and moves the boat ahead briskly with the bow slightly pointing skyward. 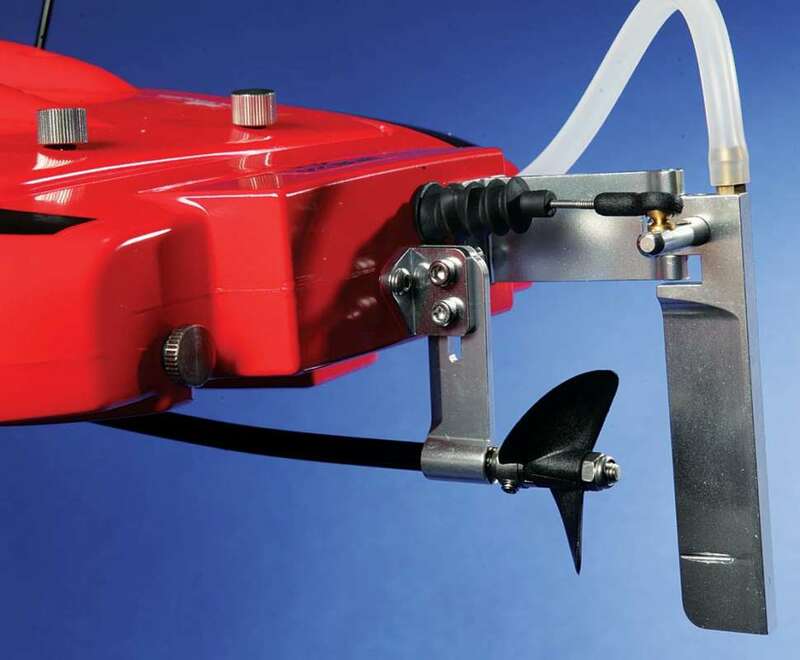 As you input more power to the motor, the boat in-turn speeds up and gets up on plane. The Blackjack 24 rides nice and level across the surface of the water and looks great doing it. Its super brilliant colors make it very easy to see on the water even when it is a good distance away. Steering input is met with instant response and the boat will turn quickly while also staying level. It was apparent to me that the offset rudder did enhance its ability to maintain speed in corners, although it does steer a bit better to the right than to the left. This is a trade-off I am willing to accept in order to maintain cornering speed. 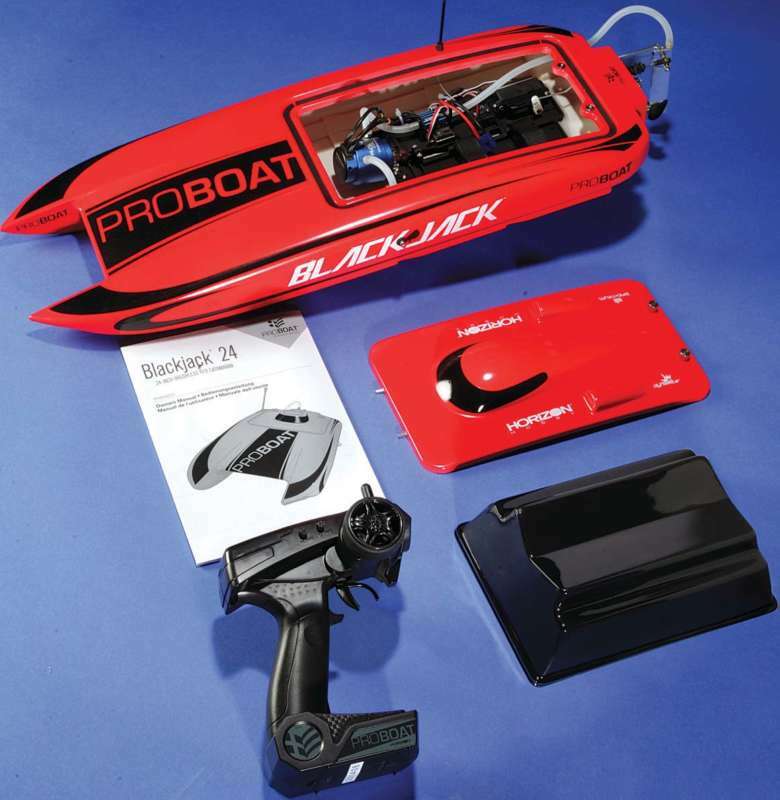 A reliable 2.4GHz pistol grip radio system and plastic boat stand is included with the Blackjack 24. The Dynamite 2000Kv brushless inrunner motor provides the Blackjack 24 with some serious performance. Water-cooling is not only provided to the brushless motor, but also to the speed control. Pro Boat has spec’d anodized alu- minum hardware for the running gear which looks awesome and is robust. OVERALL LENGTH 27.75 in. HULL LENGTH 25 in. There is no question that I underestimated the Pro Boat Blackjack 24…don’t let its smaller size fool you. This catamaran is fast when run on a 2S LiPo and just crazy fast with a 3S battery pack. You also benefit from great handling with the catamaran hull design, its light weight and its offset rudder, which makes it easy to drive this boat at most any speed. I really like that its smaller size made it more convenient to transport and store yet you are not short-changed with less performance. I also found that the included electronics worked very well and made for an issue-free testing experience.